Growing up, my Dad collected bottles. Mostly soda bottles. He kept them in various places including on top of the cabinets in our laundry room. He even got into collecting cases. There were plenty of Coke and Pepsi ones, but there were also a bunch of obscure ones. Some from the 80's but mostly older than that. When my parents moved out of my childhood home a few years ago, they had an Estate Sale. And guess what? A bunch of my Dad's treasures sold. That included many of his bottles. I think he kept a few on hand, but for the most part, he parted with a long-term collection. So, when I was at a garage sale on our block a few weeks back and I came across these bottles, I had to grab them. I mean...look at the prices: five cents a piece. That's nuts, right? I mean...even if they were junk, throwing them away cost only a dime. 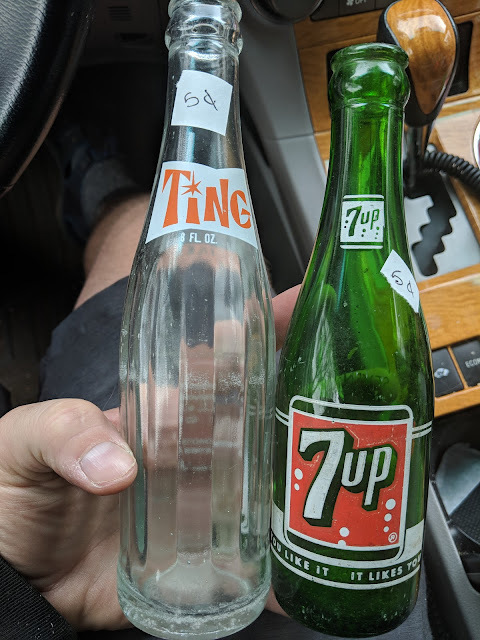 The 7-up one is from the 50's according to my Dad. The Ting bottle is old, but has a zip code on it from the bottler. Turns out, that's a signal! Zip codes were introduced in 1963. So, if you see any vintage item that has a zip code on it? Guess what? It is from 1964 or more recent. I don't think this is going to spark my Dad to get right back into bottle collecting to the scale he used to be in it, but I know when I gave them to him, he smiled a bit and I did, too! Also, for those tracking at home (nobody but me! ), this is the second 'vintage 7-up' item that I've bought and posted about here on the blog. The first were these 'uncola' upside-down soda glasses that I bought on the Bluff in St. Joe's a few Summers back.